The bestselling 30-Second... series takes a revolutionary approach to learning about those subjects you feel you should really understand. Each title selects a popular topic and dissects it into the 50 most significant ideas at its heart. Every idea, no matter how complex, is explained in 300 words and one picture, all digestible in 30 seconds. 30-Second Leonardo da Vinci uses this unique approach to grapple with the truly diverse thoughts of the ultimate Renaissance Man. Artist, anatomist, sculptor, inventor, architect, cartographer, mathematician, musician, botanist, geologist the word polymath does not quite do Leonardo justice. The painter of the Mona Lisa and conceptualizer of the helicopter seems like a Renaissance superhero. Here, the worlds leading Leonardo scholars present an instant and expert guide to the breadth and brilliance of his greatest innovations. 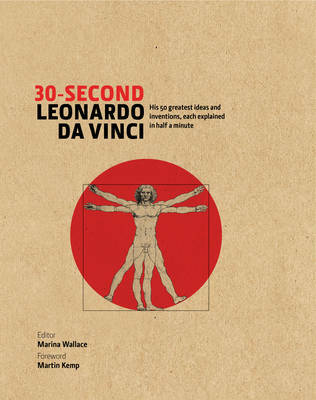 Buy 30-Second Leonardo da Vinci by Marina Wallace from Australia's Online Independent Bookstore, Boomerang Books. Marina Wallace is Professor of Curating and Director of Artakt at Central Saint Martins College of Arts & Design, University of the Arts, London. She was Co-Director, with Professor Martin Kemp, of the Universal Leonardo project.